If you’ve followed my column for at least a few months, you know I’ve tried several home security camera systems. They’ve all been pretty decent, but I always wind up reverting back to the free Presence app: I use my current smartphone to act as a hub for my monitors, each of which are actually just the cameras on old iPhones and an iPad I place around my home when we’re on vacation. While it’s a little bit of a flimsy arrangement, it is free and effective. But that’s all changing, from now on. I’ve been testing out the new SpotCam Sense and SpotCam Sense Pro for the past week. The only real difference between the two models is that the Pro is waterproof and can also be used outdoors. Each is about six inches tall, on its included stand. And by the way, the stand slips swiftly into an included wall mount kit -- for those wanting to get the unit off countertops and desks. Each camera is 1080P full HD and provides a wide-angle 155-degree view, as well as super low light sensitivity that works even better in the dark than I expected. And it can provide free-for-forever continuous 24 recording hours that it stores securely in the cloud with encryption. Like my free rig, you use your smartphone as the monitor hub (or you can log into your account on the company website and watch). Unlike my free rig, though, the SpotCam has no delay on live action. What you see is happening in real time. You can also speak into your smartphone and the people where you placed the camera will hear you loud but somewhat muddied. Setting it all up on your smartphone is pretty easy and seamless, once you establish your account and are in your home’s WiFi zone. An instruction book is included, and there are videos online to help out. To me, it’s a more stable version of the free app that I have. 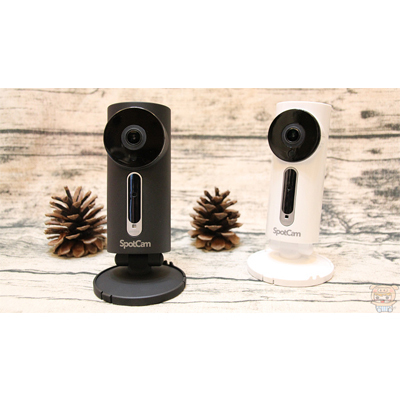 While it has the pluses of that app -- including easy set-up, common sense controls, and easy playback of recorded video -- it also lets you receive active motion or audio event alerts via email, watch temperature and humidity sensors, and schedule when you want the cameras to turn on and off. The only feature I question is that the SpotCams need to be plugged in. Each camera includes a 10-foot power cable. So while the Pro model may be waterproof, I’m guessing its power cable is not. Why isn’t that particular unit battery operated, so that I can actually keep it outside -- during rainstorms, foggy days, etc? And if I wanted to use it as a front door monitor, it would be great to be able to mount it up high above the door where people won’t mess with it. That there’s a power cord hanging from it kind of eliminates that option. Just saying. By the way, these new models are the new/improved/sleeker versions of the original that I reviewed last summer. As with their predecessor, they're very simple to use and they get the job done well.